& don't miss the cooking video below..
grilling. A KosherChannel exclusive new, moist chicken breast recipe. Serve with Roasted Potatoes, Israeli Salad & Corn and Tomato Salad for a fantastic, simple crowd pleasing meal. 1. Preheat oven to 350 degrees. In a small oven proof pan mix together paprika, cumin. thyme, red pepper flakes. Toast spices in preheated oven 1-2 minutes until fragrant. 2. Using a mortar and pestle or the flat side of a large knife, mash together the garlic cloves and salt until a paste forms. Transfer to a small bowl or measuring cup and mix with toasted spices, black pepper, olive oil, lemon juice, and parsley. 3. 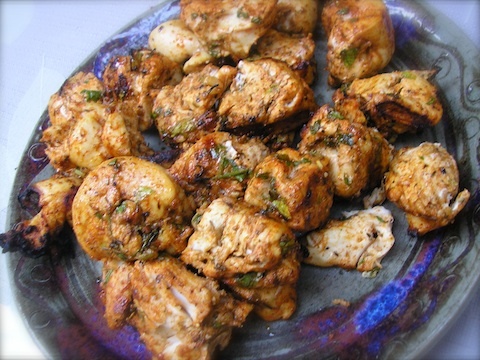 Cut chicken into 1 1/2” cubes. Place in a large sealable plastic bag or storage container with a tight fitting lid. Pour marinade over all. Cover, shake to coat well and refrigerate several hours to overnight. 4. Spray cold grill grates with nonstick cooking spray and preheat medium high. Using metal skewers or bamboo ones which have been soaked in warm water for 30 minutes, skewer chicken. Discard marinade. Grill 3 minutes per side or until firm to touch. Alternatively, broil skewered chicken in a pan placed on the second shelf of the oven for 3 minutes per side or until firm and well-browned. If video does not show in the above space, click here.